A busy street in Manhattan. Whether you live in a huge metropolis or quiet small town, you’re not safe from the flu and you need to get your damn flu shot. But different U.S. cities do experience the flu differently. In the wake of the most devastating flu season seen in decades this past winter, a new study seems to show how and why the influenza virus hits some areas of the country harder than others. It suggests that smaller cities and towns are more likely to experience shorter but more intense peaks of flu activity, while larger cities have to deal with flu cases spread more widely throughout the winter. Researchers looked at countrywide data on people’s visits to the doctor for flu-like symptoms from 2002 to 2008, using it as a barometer for flu activity. Overall, they looked at visits made in over 600 regions of the country—in cities and towns of varying sizes as well as different patterns of organized movement. 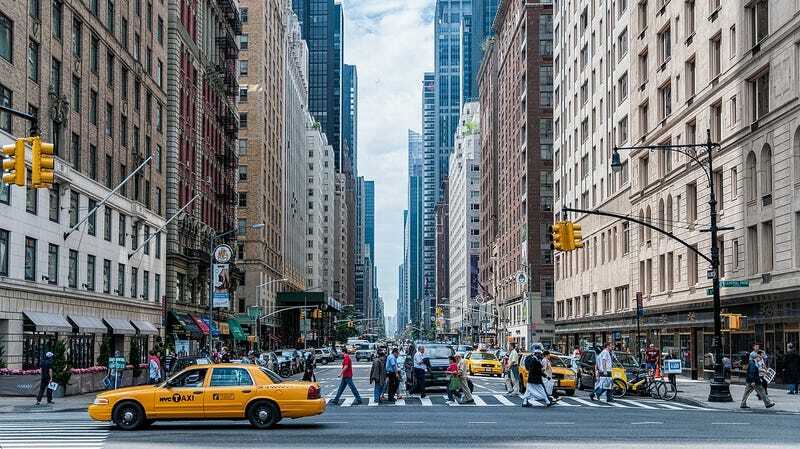 For example, cities like New York and Miami have lots of organized movement, because people live in densely packed residential neighborhoods and also need to flock to specific areas of the city for work. Because the typically low humidity of winter helps the flu virus stay in the air longer, the researchers also looked at how changes in humidity influenced the patterns of flu transmission in these areas. In the large, sprawling metropolises, the researchers found, flu season was more evenly spread out during the winter. And in smaller cities with less organized movement, like Atlanta, cases were more bunched together in shorter peaks of flu activity. Larger shifts in humidity did play a role in greater flu intensity, but mostly only in smaller cities. The findings, published Thursday in Science, were somewhat surprising, according to lead author Benjamin Dalziel, a infectious disease ecologist at Oregon State University. “It was counterintuitive to us that the larger cities with more highly organized movement patterns would have the more diffuse epidemic,” Dalziel told reporters in a media conference held Tuesday. While it’s known that humidity can affect the spread of flu, Dalziel and his team say that this effect is less apparent in places where people are more densely packed together. That’s because, in these areas, the flu can more easily rely on close contact between people to stay active throughout the winter, regardless of how humid it is. In smaller cities without these living conditions, the effect of low humidity is more pronounced, helping cause peaks of snotty, sniffling disease. Dalziel and his team believe their approach could be adapted to study how other infectious diseases, including pandemic flu strains that are spread outside of the flu season, spread differently from city to city. It could also be used to study transmission patterns in major cities outside of the U.S. as well. And the more data that comes in, they added, the more likely that we could someday predict how the flu will spread before it even gets here, which would allow us to better respond to it. In smaller cities, that might involve providing added resources to hospitals and doctors so they can better handle an sharp influx of flu victims. While in larger cities, the better strategy would be making it harder for the flu to spread from person to person. We might even someday know, on a city-by-city level, when exactly is the optimal time for people to get vaccinated. All of the predictive tricks are still a long ways off, Dalziel noted. And while their research does take a close look at how climate affects flu spread, his team is careful to point out that their research isn’t meant to figure out how the current trends in climate change could change the flu season. “It’s important to note that our analysis was not designed to predict precisely what will happen with flu epidemics under climate change,” he said. The 2018-2019 flu season could start as early as late October. It takes two weeks after the flu shot to be fully protected, so go get vaccinated!